RIO DE JANEIRO, BRAZIL – The Rio Content Market, the largest event for TV, web and mobile production in Latin America will bring together 1,500 players from the entertainment business in Rio to discuss the market starting Wednesday, February 29th. Professionals from 23 countries, including the U.S., the UK and Canada are coming to the event with Jack Bender, executive producer and director of the global hit series “Lost” and “The Sopranos” to give the keynote speech. 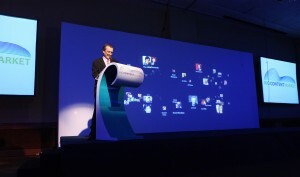 The president of ABPI-TV, Marco Altberg, gives a speech during the opening ceremony of Rio Content Market's first edition, photo by Belém Com. 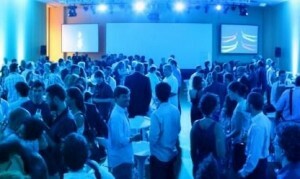 The first edition of the Rio Content Market was in 2011, and was organized by the Brazilian Association of Independent TV Producers (ABPI-TV). The intention was to bring producers and buyers together, and after a successful debut, the event is back in 2012. Panels and case studies are planned to foster the exchange of information and ideas about the latest audiovisual production technologies and trends. Executives from Ryan Seacrest Productions and Microsoft Bing will do a case study analyzing branded entertainment. Twitter’s director of business development, Glenn Brown will talk about whether Twitter and social media is an effective promotion tool for TV. Canal Futura’s manager of programming, journalism and engineering, João Alegria, will be mediating a panel on television, education and the advancement of new technology. “Events like Rio Content Market are evidence that the audiovisual market in Brazil has become very developed in recent years,” says Alegria. “There was a swift process of professionalization of the sector, with every effort to regulate it and the different ways of promoting and encouraging domestic production already defined. The trend in Brazil is growing and expanding to other countries,” he explains. Other workshops at the event include The Transmedia Lab and business rounds – sort of like speed-dating, but twenty minutes in duration instead of two – will put independent producers face-to-face with network executives and commissioning editors. Opening ceremony for the 2011 event, photo by RioContentMarket. “The business rounds have everything to do with Futura which historically is a network where the majority of the content is provided by independent producers,” explains Alegria. The President of Brazil’s National Cinema Agency (Ancine), Manoel Rangel, will break down the primary changes brought about by the recent approval of Brazilian law 12.485. Implementation of the new law establishes quotas for Brazilian programming on paid channels. The law also includes quotas for Brazilian channels and networks to be included in cable and satellite packages, which will increase the demand for programming on subscriber-based operators like cable and satellite TV. The Rio Content Market is an event produced by the Brazilian Association of Independent TV Producers (ABPI-TV). Representing providers in many political discussions at the state and federal levels, more than 150 member companies make up ABPI-TV today, working in various genres like animation, documentary and fiction/narrative.